The Hillsborough High School Rockin’ Raiders Cheerleading Team boosted school spirit, were ambassadors of goodwill and fostered student participation at sporting and community events throughout the year. The team was formed three years ago, in collaboration with The Sparkle Effect, to present an opportunity for inclusion and diversity allowing students of any ability to cheer. Through their fundraising efforts they purchased new uniforms and pom poms which they proudly displayed at football, soccer and basketball games as well as at the Hillsborough Memorial Day parade. The Hillsborough High School Rockin’ Raiders Cheerleading Team was led by Coach Robin Pidany and Team Captains Sarah Friedman and Madison Hansen. The members consisted of Christina Androulakis, Klaudine Bessasparis, Renee Depew, Lily Doyle, David Finer, Victoria Franco, Rachael Grennan, Sara Hamill, Jillian Keller-Facas, Julie Lashen, Leah Lloyd, Ronise Mayes, Elena Mazzeo, Kira Piasecki, Lindsey Probola, Lauren Silverman, Kristen Welker, and Olivia Zielinski. 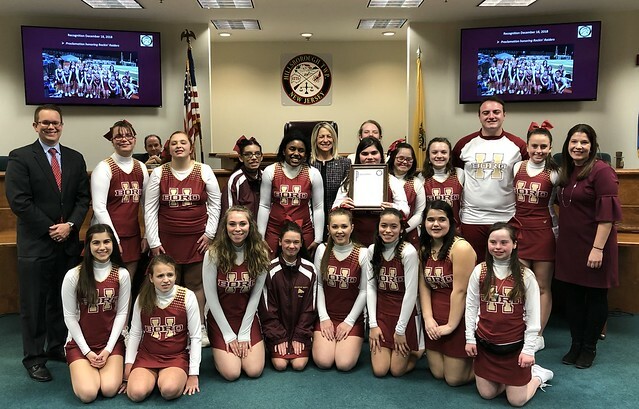 The Hillsborough Township Committee commends the Hillsborough High School Rockin’ Raiders Cheer Team for their hard work in fundraising and adding to school morale. Hillsborough Township Mayor Gloria McCauley and Deputy Mayor Doug Tomson are joined by members of the Hillsborough High School Rockin’ Raiders Cheerleading Team.